People with jaw problems can experience referred pain. That means that we can get aches and pains in places that seemingly have nothing to do with the original problem. In addition to jaw pain, folks with TMD can have back pain, chest pain, eye pain, ear pain, etc. Before I knew I had TMD, I was going to physical therapy for back pain, seeing ophthalmologists for eye pain, and otolaryngologists for ear pain. I even went to the emergency room on several occasions for my chest pains. The doctors were treating all of my symptoms but no one was treating the root of my problem - the messed up jaw muscles. If someone had figured out that I had TMD, I could have avoided all of the other doctor visits. What does this have to do with our pets? When our pets have a behavior issue that concerns us, we will often try to treat the symptom instead of treating the whole dog. Imagine a dog who has accidents indoors, barks incessantly, and chews the furniture.` Some pet parents will treat each issue as something to suppress or punish. Some parents might throw a can of pennies at the dog for barking, smear bitter apple on the furniture for chewing and force the dog to wear belly bands for the accidents. A guardian who looks at the whole dog might try to find a root cause in order help the dog. Maybe the dog is stressed because the new neighbors are making a lot of noise. 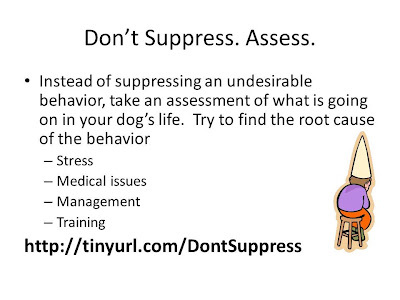 Stress can cause barking, inappropriate elimination and inappropriate chewing. So if stress is addressed, the other issues might disappear. 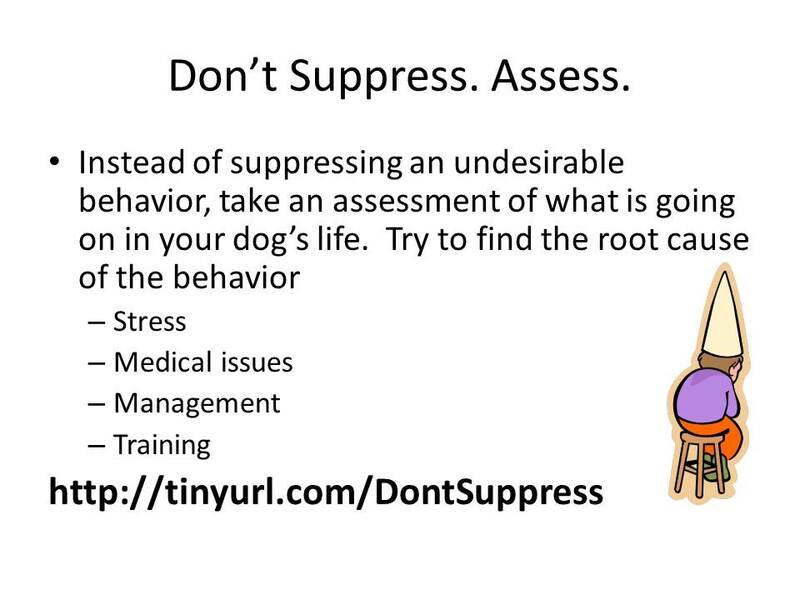 Is your dog displaying some behavioral issues that you don't like? Tell us about it. We might have some ideas.